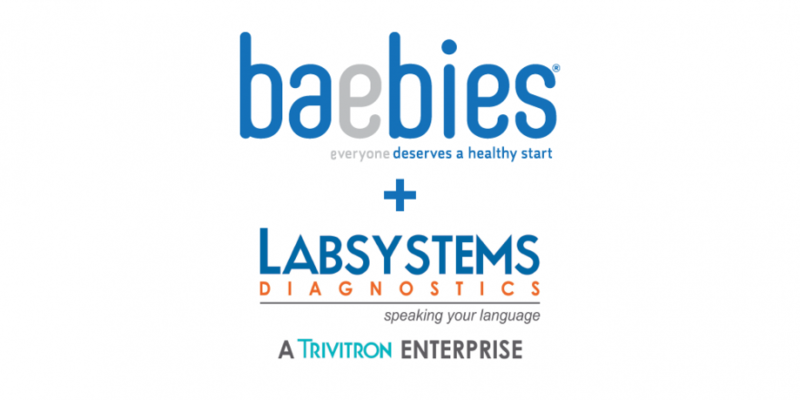 DURHAM, N.C., September 8, 2017 — Baebies, a company focused on advancing newborn screening and pediatric testing, today announced that it has signed a bilateral distribution agreement with Trivitron’s Labsystems Diagnostics Oy to deliver a wider range of newborn screening solutions across several global markets. Baebies will distribute Labsystems’ newborn screening products in the U.S. after obtaining regulatory clearance, while Labsystems will distribute Baebies’ SEEKER® platform internationally; SEEKER is FDA authorized and CE marked. SEEKER is a high throughput laboratory solution for newborn screening and is currently configured to perform testing for certain lysosomal storage diseases. In the wake of FDA authorization and CE marking, there has been a tremendous surge of interest in Baebies’ SEEKER platform from around the world. This first distribution agreement for Baebies enables the expansion of the company’s offering in the United States and provides a means to reach other parts of the world with its products. Baebies is committed to delivering innovative products and services to expand current options for newborn screening and pediatric testing. The company is also developing FINDERTM, a rapid near-patient testing solution that uses low blood volume to quickly perform time critical tests. Baebies recently announced the launch panel for FINDER to include tests for glucose-6-phosphate dehydrogenase (G6PD), total serum bilirubin, albumin and direct bilirubin on a single cartridge for hyperbilirubinemia. NeoMass AAAC is a Tandem Mass Spectrometry Reagent for Expanded Newborn Screening Panel. Expanded Newborn Screening is a preventive pediatric screening service performed to detect congenital or inborn errors of metabolism. NeoMass AAAC is used to detect concentrations of amino acid, free carnitine, acylcarnitines, succinylacetone and argininosuccinic acid. This is a ready-to-use kit for 960 Tests and suitable for multiple instrument platforms with Nonderivatized method – simple sample preparation steps.